Report results are based on an assessment in 2012 that tracked students in more than 40 countries and surveyed them on computer habits and conducted both written and digital tests. On average, seven out of 10 students in countries surveyed use computers at school and students average at least 25 minutes a day online. In some countries, like Turkey and Mexico, about half of the students don’t have access to a computer at home. IT IS HOW YOU USE TECHNOLOGY! How do you teach with tech? WHAT DO YOU DO WITH IT? You can’t get smarter just rubbing Einstein’s head. If he were still alive, you’d have to talk to him. You’d want to interact to improve. Before I became a high school teacher, I taught teachers how to use technology. I’ll never forget my discovery about edtech. I was lost in the building. I opened the door to the closet instead of the conference room. The closet was full from bottom to top with computers in boxes. I had just been working in a poor school with few computers. But this closet was full. When I asked if the teachers could have them, I was told they stockpiled them at the end of the fiscal year. They would figure it out. Over a year later when I went back and peeked, the closet was still half full. Nobody figured it out. Teachers must know how to teach with tech. It is not about what you HAVE but what you DO with what you HAVE. Unless you HAVE NOTHING — and then you don’t even HAVE a chance. And that is unfair. Technology is here. It can make a massive difference if you HAVE the know-how to teach with it effectively. I went to a recent professional development about differentiated instruction. It was one day of lecture. I couldn’t believe it. We need PD! But teacher training must model what we’re teaching. When I teach collaborative writing, we write collaboratively. When I do a workshop on global collaboration, we collaborate globally. When I do a workshop on differentiation, I differentiate. To do otherwise is not only hypocrisy, but it is also a royal waste of money. A gulf yawns between the haves and HAVE NOTS. And the latter two in this list aren’t much different. It is more than technology access. It is how we teach with what we have. It would be like giving new customer care reps an awesome new system and not training them. But it happens each and every day in our schools. This report is no surprise. 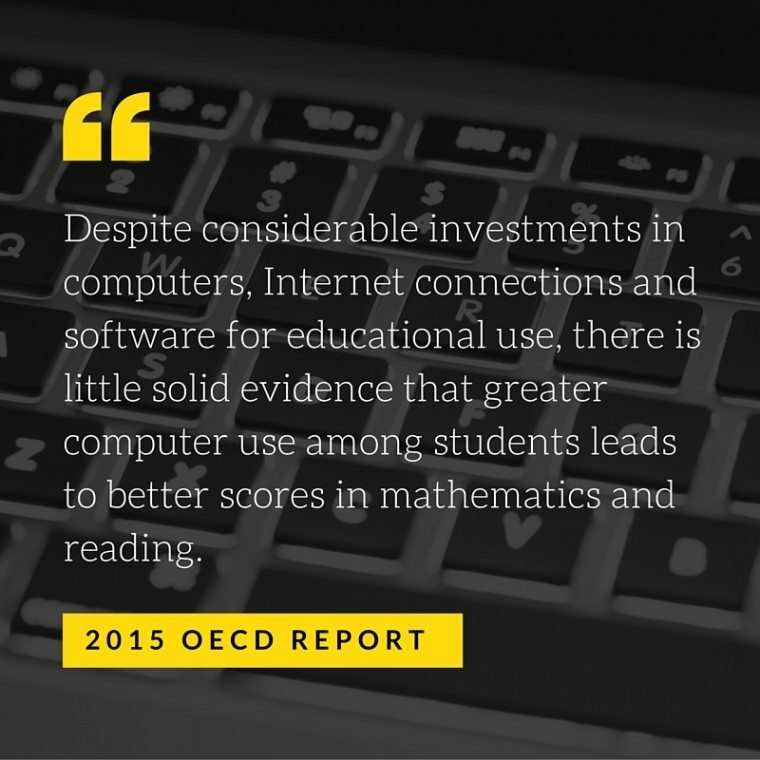 It just validates what many in education technology have been saying all along. If you’ve got the technology, let’s talk about good teaching with it. The post Why Technology in Classrooms Doesn’t Always Boost Education Results appeared first on Cool Cat Teacher Blog.